The Admiral’s Tea Party is this Saturday! We have been preparing the event for months now, so hope to see you there! Here are a few of the photos: some of the poets on a trip to the site, some inspirations for costume and set and our lovely poster! Entry to the tea party doesn’t need to be booked, but if you want to go on the walk you should as spaces are limited. The 1930s photo that started it! As part of the Paint The Town festival we are hosting a night of poetry and words about mental health to accompany Bridget Aphrodite’s show in the festival ‘My Beautiful Black Dog’. Billed as ‘a musical about depression’, this electrifying show challenges the urgent stigma around mental health and encourages the audience to take ownership over their own black dogs whilst channeling infectious dance moves, swagger-boss costumes and banging tunes! Roundabout Nights regulars Dylan Oscar Rowe and Spreken are confirmed headliners and we will have our usual pre-bookable open mic, in what promises to be an intense, educational and entertaining night. We are taking a little break from Roundabout Nights over April – there are so many other good lit events you could go to in April and you just might see us at them! Roundabout Nights should be back on 9 May at Poco Loco! Here are some photos from Roundabout Nights presents Bill Lewis – Now and Then. Readers in our first half were Sam Rapp the dyslexic poet, Neil R Wood, Clair Meyrick and Barry Fentiman-Hall, then Bill read poetry from the start of his career right up to now, accompanied by anecdotes. Thanks for the pics to David Bahia, Marilyn Simpson and Chris Tong. We are very proud to announce that the legend that is Bill Lewis will be at Poco Loco on Monday 15th February 2016 reading pieces from The Medway Poets days right up to material from his forthcoming publications. Poco Loco, 58 High Street, Chatham, ME4 4DS. 15 February 2016, 7.30pm start. Free. Open mic slots are available in the first half of the evening. Please book via our Facebook event page. 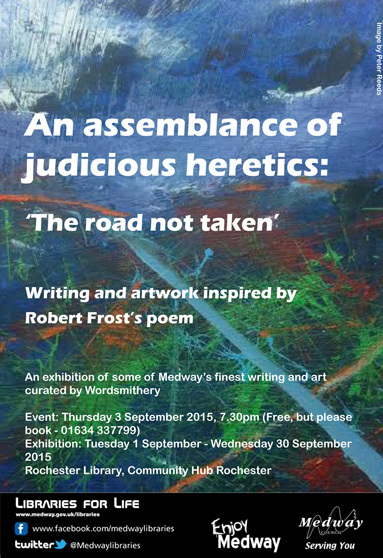 An Assemblance of Judicious Heretics is a large scale collaborative project from Medway-based literary art organisation Wordsmithery (the people who bring you ME4Writers), fusing words and images from writers and artists from Medway and beyond. Lat year in our inaugural year, as part of the Rochester Literature Festival, we teamed up 22 writers with 20 artists. This year the exhibition has grown by a third, as 32 writers will have their work interpreted by at least 27 artists! We asked writers to write a piece inspired by Robert Frost’s poem ‘The Road Not Taken’, then we gave these writings anonymously to artists who interpreted them without knowing who the authors are. The collaborations are revealed in our exhibition which runs until from 1-30 September 2015 at Rochester Library, then for a fortnight at Lordswood Library (timings tbc). Artwork by long-standing and established Medway writers and artists sits alongside the work of new talent in this stunning exhibition. Some of the writers whose work features are Bill Lewis, Maria C McCarthy, Sarah Hehir, Sam Fentiman-Hall, Philip Kane, and some of the artists include: Peter Reeds (whose art features as the illustration for the exhibition poster), Heather Haythornthwaite, Chris Van Beck, Dianne Reeves and Maggie Drury. Artists have interpreted the texts in a variety of media – including, photograms, oil paintings, photographs, textiles, collage, linoprints and sculpture. The texts which inspired the artwork will be revealed in full at an event on 3 September 2015, where the writers will read their work, and leave a booklet of the stories and poems for visitors to read. The event, which is free to attend, takes place at Rochester Library. Wordsmithery are also planning to publish a limited edition catalogue of the exhibition for £15, which will be available to pre-order from the Wordsmithery website, and at the launch event. Live readings from the exhibition: 3 September, 7.30pm, Rochester Library. Thanks to all performers at our first anniversary on 6 July. We heard good words from: SM Jenkin, Matt Chamberlain, Chris Van Beck, Split P, Dylan Oscar Rowe, Sarah March, Win Vaughn Thomas, Lioness X, Lisa Vigour, Barry Fentiman-Hall, Razz Saunders, Sam Rapp, Zach Davies. Photos by Man in the Attic Photography.